While many personal finance experts have plenty of negative things to say about credit cards, we’ve talked at length about some of the benefits of credit cards, including how to use them correctly and how not to abuse them. Like most things in life, everything is good in moderation, right? Credit card rewards fall into that category. If you’ve already paid off your debt and you trust yourself with carrying around cards without abusing their power, then it’s time you start making the credit card companies work for YOU. That’s right—everyday people like you and me who are confident with their finances have started taking advantage of credit cards and using them for the benefits they offer. Here is what you need to know about how you can choose a rewards credit card that’s right for you. There is a vast amount of competition occurring between credit card companies in order to take advantage of the unknowing consumer. To entice these naive customers, credit card companies will lure them in with rewards and sign-up bonuses for applying for their card. The rewards are a clever marketing strategy designed to make you choose one card over a competitor. Once you sign up and score the rewards point sign-up bonus, credit card companies are banking that you’ll keep the card and rack up mounds of debt on it, in turn providing them with heaps of interest. It’s no surprise that— despite these sometimes very generous sign-up bonuses –credit card companies make loads of money from the interest. After all, they’re not in the business of giving away money. According to Nerd Wallet, the average US household credit card debt stands at $15,611. That’s no chump change! Imagine all the interest credit card companies are making off of consumers? But you don’t have to be one of those people. You can join the ranks of people who have taken advantage of credit card rewards and used it to their advantage. In addition to sign-up bonuses, a lot of these credit cards will waive the annual fee for the first year. An annual fee for a credit card? Yes—these companies expect you to pay them for the privilege of using their credit card. A lot of people sign up for credit cards specifically for the sign-up bonus and then intend on cancelling the card before the one-year grace period ends. The credit card companies know this and they depend on you forgetting to cancel the card. This “forgetfulness” is how they establish a large clientele. Chances are, if you’ve been using the card regularly, you probably wouldn’t even notice the extra charge, and the annual fee would get mixed in with all your other purchases. When signing up for credit cards, it’s important to note on your calendar the following year exactly when you have to cancel the credit card in order to avoid the annual fee (if you don’t plan on keeping the card). Set that reminder for yourself! Are you a hoarder? Credit card agents reveal that a lot of people will hoard their points, hoping to save for a bigger reward, and then never end up using them. Don’t let this be you. Remember, the purpose of having a rewards card is to make the credit card companies work for you! The goal is to have them pay you, not vice versa. That’s why it defeats the purpose to not use your rewards. To avoid point hoarding, designate a specific purpose for your points and a limit on the number of points you can hoard. For example, I use points specifically for vacations. I’ve been tempted to use them for other purposes in the past, but it is a big help to save money on vacation by redeeming credit card points. On a recent trip to Mexico, we saved more than $1200 by using credit card rewards for our vacation. Christmas shopping: Save up for gift cards you can use as gifts, or to go shopping yourself to use toward Christmas gifts. Gifts in general: Only use points to redeem gift cards for others. Specific Item: Many companies offer a catalogue where you can redeem points for a specific item. Save up for just the points you need for a specific item. Flights: Use your points only to put toward airfare. We did this one year and paid only $10 in fees to fly from LAX to NYC round trip. You can choose to use your points any way you wish, just be sure to use them! That’s the key. If you go through all the trouble of signing up for a card specifically for the sign-up bonus, don’t you want to make sure you get the points? All cards require different spending requirements in order to reach the bonus. It may be you have to spend $1,000 in three months, $3,000 in three months, $3,000 in six months, and so on and so forth, but most companies will require you to use the card in order to receive the bonus. For this reason, it’s important to pay close attention to what the cards spending requirements are. Along with the renewal fee date, make sure you write down the spending requirements, and make sure you keep tabs that you meet those requirements. Remember when I said you’re only supposed to sign up for credit card rewards if you can use your cards responsibly? Carrying a balance is not responsible. As soon as you start paying interest on the items you purchase, you are being irresponsible. At this point, you need to reevaluate and decide if you can really handle credit card use. By carrying a balance you are defeating the purpose of saving money with reward credit cards. Now that you know the ins and outs of credit card rewards and how they work, it’s time to choose which credit card you’re going to sign up for. If your priority is travel, sign up for a travel rewards card. If it’s hotels, sign up for a hotel rewards card. Flights? Sign up with an airline rewards card. There are all different kinds of options when it comes to rewards, so choose one that you think will benefit you the most. 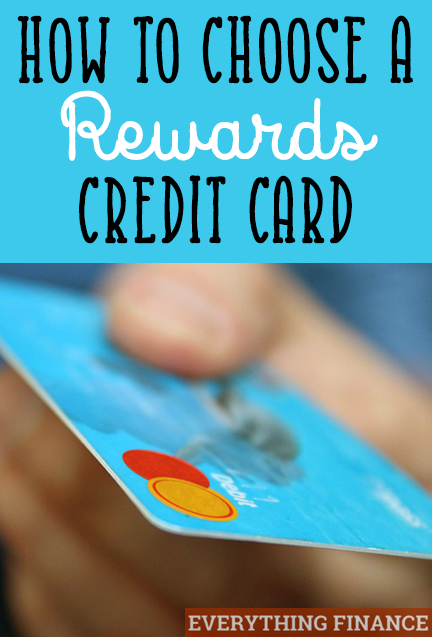 Here are some options for credit cards with good rewards. Southwest Airlines Rapid Rewards: Read the Everything Finance review on this popular card here. This company will often offer promotional sign up bonuses of 50,000 points. However, the annual fee of $99 is charged to your first billing statement. Still, $99 for what essentially equals two free round-trip airfare flights is a pretty darn good deal. You also get 6,000 bonus points every year on your anniversary if you choose to keep the card. If you fly to locations where Southwest flies, then this is a very good looking card. Barclaycard Arrival Plus World Elite Mastercard: With a 40,000 sign up bonus when you spend $3,000 in the first 90 days, 2x points on all purchases, and 10% miles back every time you redeem for travel statement credits, it’s hard to beat this awesome card for rewards points and it’s one of my favorites. Citi Double Cash Card: If you’re not comfortable with an annual fee card, this credit card has no annual fee and offers 2% cash back on all purchases. Essentially, you earn 1% cash back when you make the purchase, and an additional 1% when you pay it off. And considering one of the first rules is to never carry a balance on a card, you’ll be paying it off every month, right? It’s like this card rewards you for being smart with finances! Chase Freedom: Earn 5% cash back on rotating categories throughout the year. Get a $100 sign up bonus after you spend $500 on purchases in the first 3 months. The categories rotate throughout the year, so it may be grocery stores for one quarter, restaurants another quarter, gas stations another quarter and so on. For a no annual fee card, it’s a pretty sweet deal. When it comes to credit card rewards, there are a lot of options out there. Do your research or keep a list of all the cards you’re interested and rotate them out to have the most savings. As long as you stick to using the cards correctly and avoid common mistakes, there are lots of advantages to using a rewards credit card.